Gospel - Hump Wilderness Additions. Click image to enlarge. The approximately 55,000 acres of roadless lands adjacent to the Gospel – Hump Wilderness include land that drains into two major river systems – the Clearwater and Salmon Rivers. These important areas should have been included in the original boundary, but unfortunately were left out. The Johns Creek watershed is the most important bull trout stream in the entire South Fork Clearwater drainage. It is also provides crucial habitat for steelhead and salmon. Currently, only the headwaters of Johns Creek are protected in the existing wilderness. The Forest Service has recommended this roadless drainage, from its headwaters to its confluence with the South Fork Clearwater, as a wild river. This entrenched stream forms a beautiful canyon as it travels north to the South Fork Clearwater. The steeper slopes in and around Johns Creek provide crucial mountain goat winter habitat. Even the Forest Service and Idaho Department of Fish and Game have admitted the importance of this area. Old forests, some with unique Pacific yew stands, are prime moose winter range, too. 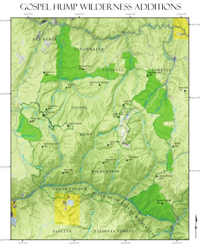 The Tenmile Creek watershed is critical for steelhead, salmon, and bull trout. The headwaters of the West Fork Crooked River and Boulder Creek provide high-elevation lakes and forested terrain respectively. The West Fork Crooked River is also a rare population stronghold for bull trout. Indian Creek and surrounding country are breaks along the Salmon River providing critical habitat for bighorn sheep. Studies in the 70s and 80s suggested the most important wildlife habitat in the region consists of the roadless lands contiguous to the existing wilderness. Vegetation is diverse, as the additions are found in varying elevations around the Gospel – Hump Wilderness. The dry bluebunch wheatgrass communities, interspersed with ponderosa pines, are found along the Salmon River Breaks. Whitebark pine is found in the upper reaches of Boulder Creek. Topographically, the Gospel – Hump additions are diverse, too. The Salmon River is found at around 2,000 feet and some peaks are in excess of 8,000 feet. Some trails can be located, though much of the area remains wild and trailless. With the exception of a sliver of land near Crooked Creek and the headwaters of the West Fork Crooked River, the Forest Service has refused to protect the majority of this wildland under the weak Idaho Roadless Rule. Furthermore, the agency refuses to study this erroneously excluded land for wilderness potential, in spite of acknowledging their roadless nature. Thus, these additions are threatened with development even more so than other roadless areas on the Nez – Perce Clearwater National Forests. The wildlife habitat and aquatic values alone make these wildlands an important candidate for inclusion in the Gospel – Hump Wilderness.